Looking out back this morning I saw the quail hatchlings following their mom along the back fence. Dad was on top of the fence watching. 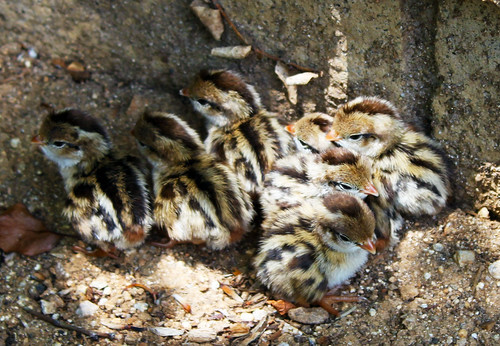 Quails must be like chickens, the babies are up and running around right away. They don’t spend anytime in the nest. They were still in their eggs yesterday when I checked. They are really tiny, and move really fast so it was hard to get a photo. I cropped this one down and enlarged it. They actually blend into the ground really well, so I upped the color vibrancy to bring out the golden tones in their feathers. This entry was posted on Tuesday, May 19th, 2009 at 3:00 am and is filed under Garden. Tagged: Garden. You can feed this entry. You can leave a response, or trackback from your own site.